Our Theatre is available for events. 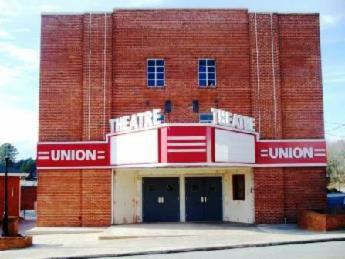 The United States Department of Agriculture (USDA) $99,829 Grant to Downtown Development Authority of Union Point (DDA) for the "Union Theatre" Revitalization is complete. Remove the historically inappropriate 1984 glassed-in display area and install two new code compliant main entrance doors where the original doors were and re-open the original ticket booth window (Done). Partially upgrade the electrical system to meet current codes and future needs. Complete the "air-conditioning" phase of the theater's "heating and air-conditioning" system. We wish to thank The United States Department of Agriculture for its continuing support for our efforts to revitalize the theater and Union Point.